Winter and I are not friends! Being born and raised in the southern United States, I have never been a fan of cold weather. While I don’t care for really hot weather either, if I had to choose between sweating to death or being turned into a popsicle, I would definitely choose the former. besides, if everyone moved south, who would be left to shovel the snow? Understandably, many yanks migrate south when the temperature drops. After all, everyone deserves to thaw out at least once during the winter. The snowbirds, as they are called in the south, suddenly appear like blackbirds in a corn field and disappear just as swiftly in April or May. My theory is that while they enjoy the milder winters, they really can’t handle the heat. As a writer, I have become very cognizant of the weather in my stories. If the scene involves turmoil for my characters, I may have a storm raging simultaneously. If our lovers are engaged in a tender moment, the heavens are likely to be cloudless. Weather is used as a common plot device in JAFF books, mainly because it is so easy to have Darcy and Elizabeth stranded by either rain or snow, which forces them to communicate. I wrote just such a scene at the beginning of my book, Mr. Darcy’s Forbidden Love, where our dear couple is stranded alone overnight because of a flood. Though I took into account the hardships of living in the early 1800s when I began writing novels, I was not aware that England received so much snow and ice in the winter. Then I came across several articles about the Frost Fairs, which were held on the River Thames. I found them fascinating. Between 1309 and 1814 the lower section of the river froze solid at least 23 times in the London area. By the seventeenth century, however, Londoners were venturing out onto the ice of the frozen river to enjoy impromptu events which came to be known as Frost Fairs. According to my research, the last Frost Fair was held on February 1, 1814 and lasted four days. It even featured an elephant being led across the river below Blackfriars Bridge. An oil on canvas painting (below) of the fair from that year depicts coaches, sledges and sedan-chairs on the ice as a game of ninepins is played. Moreover, it was said that there were up to ten printing presses in operation making cards and popular sheet-music of the time. A printer named George Davis published a 124-page book, Frostiana: or a History of the River Thames in a Frozen State, and the entire book was type-set and printed in Davis’s stall. While unlicensed gambling, drinking and dancing were likely the greatest draws at the fairs, there were stalls selling food, drink, souvenirs and personalized keepsakes for just a few pennies. 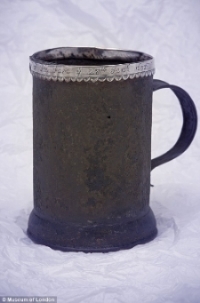 Featured in the Museum of London’s set of memorabilia are a souvenir tankard from the frost fair of 1683 and a souvenir silver spoon from the frost fair of 1683 to 1684. After 1814, the climate grew milder. Old London Bridge was demolished in 1831 and replaced with a new bridge with wider arches, which allowed the tide to flow more freely. Once the new bridge opened, the Thames never froze over in the London area again, despite temperatures dropping to -20C at times in the notoriously cold winter of 1895. You may be asking yourself why I went from talking about the weather in the United States to frozen rivers in Regency England. The answer is simple. Since I began writing Jane Austen inspired tales, I look at everything in the context of what people in that era would have seen or done. It’s an obsession that I fear I shall never overcome (not that I should ever want to). ← As happy as Mrs. Darcy? 32 Responses to Winter and I are not friends! I love the little caricature, although it’s not possible to get a larger version of it here! I have to say that I feel blessed in my life to have lived in just about every type of climate at some point. As a youth I grew up in the mountains of CA which do, as most outside the state tend to ignore, get LOTS of snow. As a kid it was awesome! Sledding, snow days from school, snowmen, snow ice cream, sucking on icicles. Great fun. As a late teen and grown up, it wasn’t as fun, but still so beautiful to see the fresh snow on the pine tree covered mountains. For a while I live in Arizona, and then later in New Mexico. Both warm places, yet vastly different. Desert vs. High Prairie, always warm vs. frosty cold winters, cactus vs. tall grasses, rocky red buttes vs. flatland, but both with fabulous storms! I’ve lived on the Pacific coast, literally walking distance to the beach, with weather that varies no more than 20 degrees all year. I’ve lived in the Valley of CA, in the shadows of the High Sierra Nevadas, where agriculture and dairies rule, winters are mild, rain is rare, temps in the summer hit the triple digits, and a pool is essential. Now we live in Kentucky. Southern humidity, warm spring and summer, lakes everywhere, lots of rain with amazing lightening storms, cold winters with some snow (not as much as where I grew up), eye-piercing greenery packed over rolling green hills, vivid autumn with 95% of the trees shedding leaves, and air so fresh and fragrant. I suppose for me I have long since learned to love whatever type of nature and climate there is. Having experienced such variety in my life, I do believe that Kentucky is my favorite. Here I have it all. True seasons, for the first time since I was a kid, yet winters not so intense. Probably the only part I miss a bit are the evergreen trees, the smell of pine. But that is a small price to pay for what we think of as paradise. Fun post! And you are correct about the weather in England and considering it with our writing. Thanks Brenda! What wonderful information. Who knew about the Frost fair, but I love the information. As a person who has never lived anywhere else than Canada or New England, I can answer you to why some of us never leave. Winter to us is like the angst in a good story. You may hate it and even scream about it, but we know that it is necessary. Without winter, you do not have the changing of the leaves and that beautiful color that comes in Fall. Without winter, you would not have sledding, skiing, skating on a wide open pond, or snowshoeing. Have you ever skated on a pond and saw for what feels like miles of openness? Have you ever stood on a snowbank in your shoe shoes and felt like a Queen overlooking her kingdom? I have many times and I can tell you. The feeling is exhilaration. So as I stare at my four foot snow banks overlooking my computer, I know exactly why I stay. It is because like the angst of a good story I know that beautiful things are coming. I am waiting for my HEA, the first beautiful 60 degree day and I can open my windows or that first growth of my tulips which should sprig up soon. Do you write? What a beautiful description! I live in PA and totally agree. Would not want the heat and humidity of Florida or Louisiana every day. And Texas was so dry! I guess it is also a story of what we know and loved growing up…for many. I smiled at your comment Sheila for Linda’s first book is out. It is “Dear Father Christmas” and is available on Amazon.com! Will have to buy that. Thanks for letting me know. I have to smile at your enthusiasm Linda! I love that we are not all alike and some actually love all the snow. We do have changes of seasons, which I think I would hate losing if I lived in a milder climate, we just don’t have the severe weather like you. Thanks so much for sharing the other side of the story! I had heard about the Thames freezing but not about the Frost Fairs. I am also aware of more than one book which uses the weather to manipulate a situation. I have read Mr. Darcy’s Forbidden Love twice…love it. Not like – Loved! All your books. I’m with you. I live in Oklahoma and we have a bit of everything as far as weather goes. Tornadoes that rearrange towns and earthquakes that scare us all half to death. We have really hot 114+ degree summers and winters with so much ice we go without electricity for days. But I’m better with the hot and the torrential rains. I hate cold weather. It makes my joints hurt and I can’t grow fresh vegetables and for this vegetarian, that’s a severe misfortune indeed!! We’ve had a couple good sized snow storms this year as well. It’s finally getting to be in the 70’s around here and I’m ready!! The frost fairs are fascinating. I has never heard of them. before your post. I live in the northeast and passionately dislike winter, but endure it because Hubby’s work is here. Although when he retires we are planning to move south. I much prefer too hot to RPO cold as wwll., althoigh I have some fond winter memories…walking across the lake with my grandfather some winters when it was particularly cold and it had frozen solid. Thank you so much for sharing Brenda. I am so glad that you learned something new Debbie! I was teasing all my friends in the north for I know many who would love to live where the climate is milder. Alas, we do what we must. It would take a lot of courage to hold a fair on a frozen body of water!! not for the faint of heart. I hate snow, odd since I live in the mountains where it snows a lot!! but we are in a major drought so we’ll take any moisture we can get right now. thanks for posting this interesting post. My thoughts exactly Carmalee. I can swim but I could not swim far or for an extended time, so I take water seriously. Besides, cold water will kill you quickly! It seems that all the states are suffering from too little or too much rain/snow. Too bad we cannot just send each other what we need since our government is selling water to other countries. Scheesh! I totally use the weather to manipulate a scene and it usually correlates with what is going on too! Love how passionate you are about this topic! Love it! I don’t like the winter but I’d rather be cold than hot because you can always put in a sweater but you can only take off so much clothes and still show your face in public. For some this is still not a problem ha ha but for me it is. Birthday suits have a purpose and a time and place. My time has long passed. I so agree with you about putting on a sweater. And when we lived in Texas while my husband was stationed at Ft. Hood and there were roses in bloom outside our door – it was NOT Christmas. I love the changes of season, the trees are so beautiful here in PA. Although we have had 15.5 inches of snow this month today is to go up to 51 degrees…after a major snowstorm yesterday. Goodbye, snow. The Frost Fair in 1814 I think is very interesting! I would love for there to be more stories (JAFF or other Regency fics) that include it! It really affected a lot of people’s way of making money, so they had to do something to come up with how to deal with it! Thanks for sharing! Alas, I fear spring is not here to stay for me in the mountains of Virginia, yet. On the forecast for tonight and tomorrow is flurries. And on Monday I wore sandals and had the windows down in the car! I have thought of that too, Rose! A story where D&L visit the Frost Fair! If I could work it in, I would. 🙂 I hear you about he changing weather. Here it is cold one day and shorts weather the next. No wonder we are all sick. As a kid and young adult, I loved going out in the snow to play – to build a snowman or snow fort, have snowball fights or go sledding/tubing. I live in ski country, but my parents couldn’t afford the expensive trappings and lift tickets for eight kids, so I never learned. Had I learned, I would have been a true proficient though, I’m sure! As an adult, I find a winter storm to be a good reason to stay indoors. I hate getting so cold that it takes a long time to thaw out, so I do wonder how people could bring themselves to hang out on a slab of ice all day at a Frost Fair. Then I think of all the people who just love to go ice-fishing and figure there must be some allure that I’m missing. Those Frost Fairs did invite the entrepreneurially adventurous to stake their claim on a patch of temporary real-estate. I picture the scene as a cross between the State Fair and the year the Winter Olympics came to Salt Lake – which was fun, but COLD! I suspect that the novelty of the Frost Fair was part of it’s draw – they were rare enough that when they happened, people wanted to be there! I agree with you about the Frost Fairs Diana, they were a unique experience and not a thing to be counted on every year. And, I can identify with you regarding the cold weather. As a child I remember that we had a lot of really cold weather and dribbles of snow more often, but I could be counted on to be outside, playing with my neighbors. I find the Frost Fairs fascinating for I do not think I could go out on a frozen river, no matter how thick the ice! Like you, my lilies are poking their heads up now and I can’t wait to see what they look like this year. Every year they multiply, which I love as I am not a great gardener and I like something that is fairly easy to grow. I know what you mean about the birds too. My hubby built a new bird feeding station and it can hold 25 to 30 birds at a time! So much fun to watch from a window of our house. Every time I think about moving north, I remember winter… And then I think twice about the whole thing! Maybe one day I’ll find a place I love enough to actually learn how to shovel snow, but for now, I’m happy where the winters are mild! Happy Spring from the Great White North (not really, just Boston). Interesting article. Happy Spring to you, too, Audrey! Boston is one of the places I could never have survived this year’s snow. Bless your heart! OH, poor Boston got the worst this year. How high are the banks of snow? Brenda, This was so very interesting. I had not heard of a Frost Fair. Fascinating stuff. I learn so much from these posts. A Frost Fair was truly making lemonade from lemons. If life hands you frost, make a fair. 🙂 Happy Spring! I am glad it was informative Barbara. There is so much more about Frost Fairs but it would take a longer article to cover it all. And, you are right! Lemonade out of lemons exactly! I can only imagine how cold the homes must have been (especially the poor’s homes) when this event happened! Brrr!